Click on the titel to see the films, to return use your Back Button. At mark 2:42, the circumstances leading up to the collision are described. 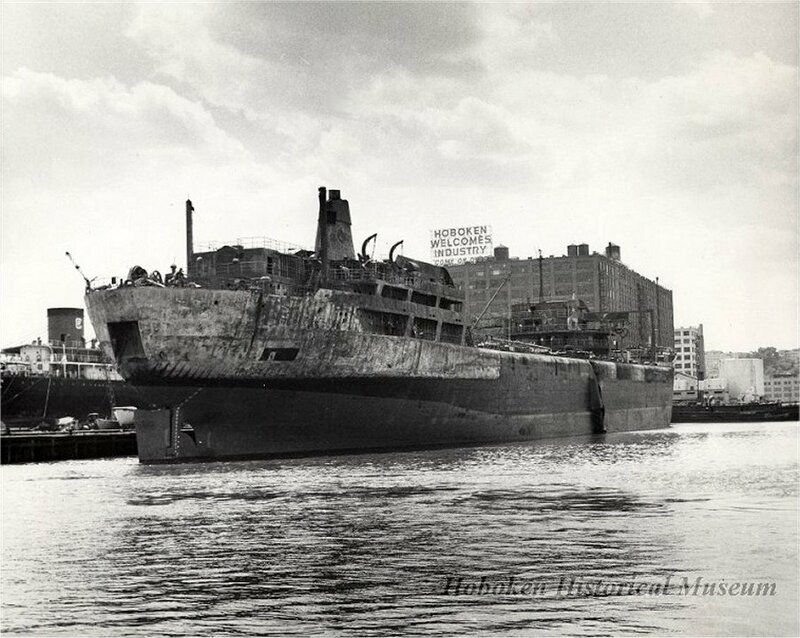 On the night before (June 1st), the SS Sea Witch was outbound from its terminal in Staten Island. The SS Esso Brussels tanker loaded with about 300,000 tankers of Nigerian crude oil and several other vessels were anchored off the Staten Island shore. The vessel preceding was to set its course under the Verrazano Narrows bridge but about 12:37 am the helmsmen reported having steering difficulty . The container vessel went in an uncontrolled swing and efforts to slow down the ship by use of the anchor and engine were unsuccessful. The collision occurred at about 12:42. Upon impact, the bow of the ship penetrated the Brussels making a 60 degree angle as seen at mark 4:23. The bow then entered the number 7 and 8 center tanks. The force of impact made the volatile Nigerian crude oil rupture and spread on the surface of the water. A heavy concentration of crude oil was trapped between the ships at mark 5:00. According to eye witnesses, flames started 30 seconds after impact. Within couple of minutes, fire spread around the Brussels. The engine room was filled with smoke and crew began to attempt to abandon ship. The master and 11 crew men of the Brussels perished in their attempt to abandon the burning vessel. On the Sea Witch crewmen took shelter on the deck house as flames spread on the water. Within minutes after the collision, the engine room of the container vessel filled with deadly smoke and had to be abandoned. Several of the Sea Witch crewmen leapt overboard and swam to safety and were rescued by commercial thugs and other vessels which had rushed to the sea. Many of the crew took temporary shelter below the main deck but as the area became filled with smoke they made their way up to the main deck. 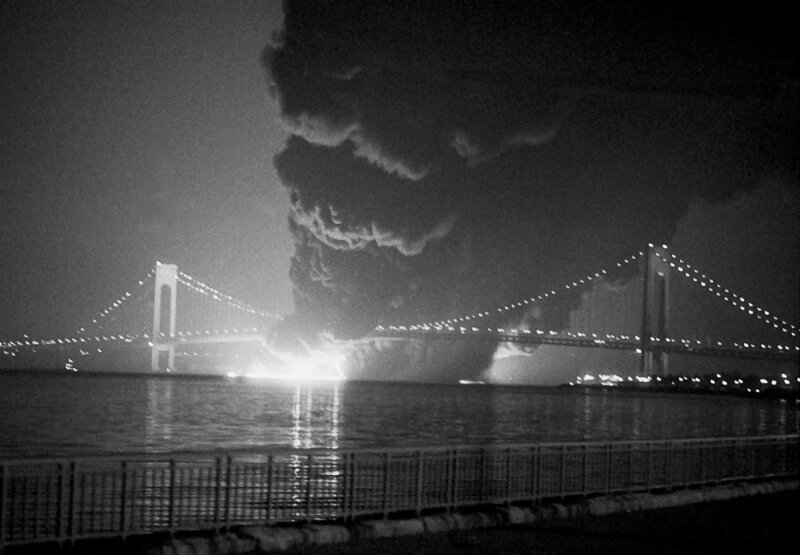 About an hour after the collision, New York Fire Fighters observed a glow of light at mark 9:05, several crew. The survivors were taken to hospitals in Brooklyn and Staten Island at mark 9:40.
n all, 32 survivors were rescued, 11 of whom were saved. At mark 11:30, the two vessels had drifted and grounded about 2 miles below the bridge. The fire in the deck containers was controlled in about six hours. At dawn, the vessels were separated by the commercial tugs . The fire smoldered for several days and some for about two weeks at mark 12:05. The damage to the interior of the ship and lessons to be learned from it is discussed. The marine board of observation determined that the steering control failure was caused by the loss of a 3/16th inch square key in a shaft which transmitted control signals to the steering engine. The key had recently been installed to replace a worn key, and when the key loosened it made it impossible to steer the rudder from the bridge (see at mark 17:40). The backup steering area was not manned at the time of the accident. The overall result of this casualty was a loss of 16 lives and property loss approaching 50 million dollars at mark 21:05. Every tragedy provides valuable lessons. The marine board recommended other vessels with the same steering gear be inspected, and all available data and information be assembled and provided to the public and industry. In summary, the accident teaches that there’s no substitute for vigilance of personnel for prevention in marine accidents. In 1977, the Sea Witch was brought into Dry Dock number 3 at the Brooklyn Navy Yard with the intention to rebuild the ship. After many years the engine room section with the forward house on top was towed to Newport News in Virginia and turned into a chemical carrier. 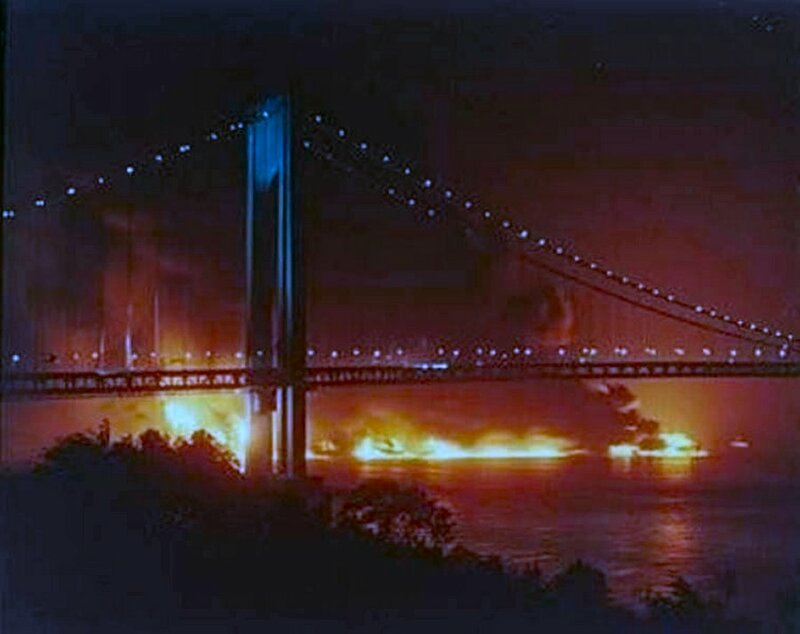 "Esso Brussels" onfire under the Verrazano Bridge. "Esso Brussels", after the fire is under control.